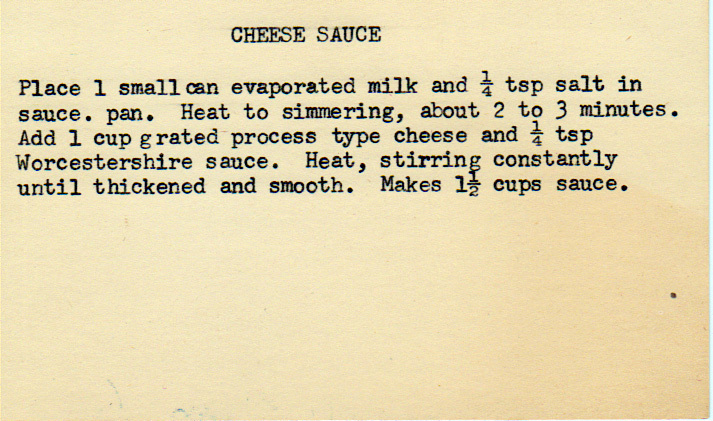 Evaporated milk, processed cheese and Worcestershire sauce. This is the second of two recipes for cheese sauce in this box. The other is here. From a box sold in San Antonio, Texas. Place 1 small can evaporated milk and 1/4 tsp. salt in saucepan. Heat to simmering, about 2 to 3 minutes. Add 1 cup grated process-type cheese and 1/4 tsp. Worcestershire sauce. Heat, stirring constantly until thickened and smooth. Makes 1-1/2 cups sauce. One of two recipes for Cheese Sauce in this box. The other is here. I was wondering when we’d see Cheez Whiz.